PC gamers and enthusiasts find themselves presented with two options when it comes to purchasing a gaming computer: prebuilt or custom built. In essence, both have their advantages. Custom-built PCs provide the user with more option in what exactly goes into their systems, whereas prebuilt gaming systems are always built for performance. In this article, we’ll explore the benefits to selecting a prebuilt gaming computer. A prebuilt gaming system is versatile, catering for every available need, whether you’re a beginner or seasoned gamer. Entry-level gamers have not idea about assembling a system but have some general knowledge of gaming machines and hardware. Therefore, prebuilt systems come in handy. Also, the seasoned gamer can still benefit from prebuilt systems, since they’ll know what they are getting for the price, and need not worry about the collecting time and resources to build a machine they can just buy. Prebuilt gaming computers as mentioned earlier, are made for performance, they are powerful pieces designed for gaming and contain the right mix of hardware, like high-definition resolution and smooth frame rates. When purchasing a prebuilt gaming PC, the company usually provides the games details, the tests on the computer and its relative performance. This is an excellent opportunity to learn more about the performance of your potential gaming computer on high-end games. 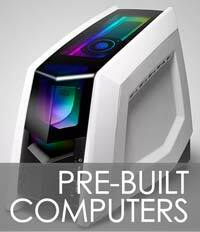 Additionally, prebuild PC are made by professionals who understand concepts like overclocking and compatibility issues. A perfectly overclocked system perform to the highest standards while maintaining the temperature levels, reducing overheating issues. Building your gaming PC is only fun if you have time to spend on the experience. However, if you are looking to save time or are not interested in researching the components, a prebuilt gaming PC is the ideal choice. All the hardware pieces are assembled correctly and tested for performance. You’re good to go once you purchase a prebuilt machine. Also, buying prebuilt gets you more support from the manufacturer, compared to custom building your PC where you have different parts with their warranties and manufacturer support. A prebuilt PC gets you one streamlined warranty as well as support. There you have it; these are some of the key benefits that come with purchasing a prebuilt gaming PC.